White is in big trouble. The group on the left side is dead, the two groups at the bottom are separated. The game seems lost and White takes extraordinary measures. During these 10 moves White manages to get at least some compensation for the losses. Let us see if Black surrendered to the pressure. White 5 takes ko. Black 8 takes ko. White 1 tries to complicate things. White puts one of Black's stones into atari. Black 2 takes the white stone. 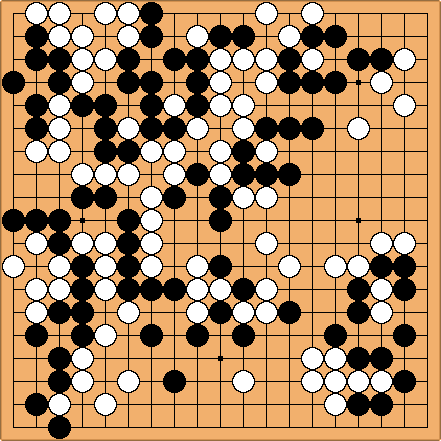 Black cannot allow White to capture the marked stone because his own group will become too weak. Black can play at 6 or take a ko. In this situation it is always wise to take the ko once, making your opponent to expend a ko-threat; and then connect at 6. White 3 is a natural ko threat that Black cannot ignore. Black 4 connects, otherwise White would capture and avoid any problem. White 5 takes the ko. Black 6 connects. The value of this connection is too big and it is quite probable that White would ignore many ko-threats for it. White 7 is wrong. The idea is to kill the black group anyway. But actually this move does not work. Black 8 takes the ko. White 9 is threatening the group at the top. Is this a correct ko threat? I don't know at this point. Black 10 gives in to the pressure. He throws away a group at the top to take what seems to be his anyway. Thus White got some compensation for the lost stones and the only worry remains a group at the bottom. However, at this point Black is still ahead.